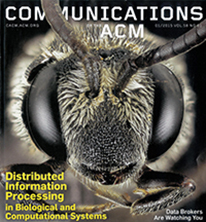 An overview article on the parallels between biological and computational systems by Ziv Bar-Joseph, associate professor of computational biology, and Saket Navlakha, a former post-doctoral researcher in the Machine Learning Department who is now an assistant professor at the Salk Institute for Biological Studies, is featured on the cover of January’s Communications of the ACM. Bar-Joseph and Navlakha last year collaborated on a study of how the methods used by yeast cells to defend against environmental threats could inform the design of more secure computer networks and how the process in which neural networks develop in the brain can be used to improve the efficiency of routing algorithms. In the CACM paper, "Distributed Information Processing in Biological and Computational Systems," they review a number of studies in recent years in which researchers likewise use biological systems to inform computational systems, or vice versa. They note that theoretical distributed computing has been transformed by the widespread adoption of wireless and mobile computing devices, which has posed new computational problems not typically faced by wired distributed systems. At the same time, the ever-increasing ability to gather detailed data about biological systems has created an unprecedented opportunity to perform joint studies of biological and computational systems to uncover solutions to problems that are faced by both domains. Bar-Joseph and Navlakha outlined similarities and differences in the constraints, goals and algorithms employed in both domains in the hope that researchers can focus on the problems that are most likely to benefit from these bidirectional studies. Accompanying the article is a video interview with Navlakha.